In the electric pressure cooker, whisk together the peanut oil, tamari, honey, rice vinegar, Sriracha, garlic, ginger, and broth. Stir in the white parts of the scallions. Place the chicken breast in the sauce, meat-side down. Using tongs, transfer the chicken breast to a cutting board. When the chicken is cool enough to handle, remove the skin, shred the chicken, and return it to the pot. Let the chicken soak in the sauce for at least 5 minutes. Spoon some of the chicken and sauce into the lettuce leaves. Sprinkle with the broccoli slaw, the green parts of the scallions, and the cashews. Substitution Tip: If you don't have any Chicken Bone Broth, use chicken stock or water. Make-ahead Tip: Cook the chicken through step 6, then cool and refrigerate both the chicken breast and the sauce. 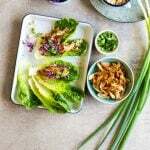 When you are ready to eat, remove the skin, shred the meat, heat up the chicken and sauce (if desired), and assemble the lettuce wraps.